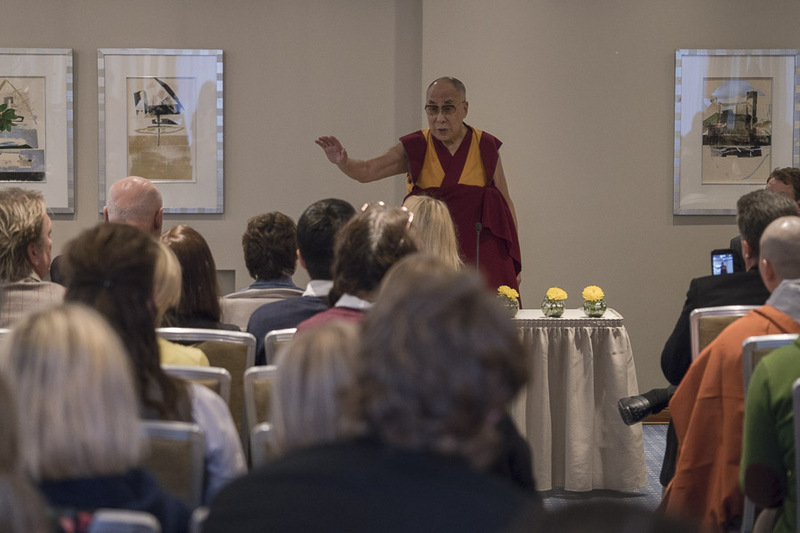 (TibetanReview.net, Oct13, 2016) – Before beginning the second day of his religious teaching in Latvia’s capital Riga on Nov 11, Tibet’s exiled spiritual leader, the Dalai Lama, met with about 75 Tibet Supporters from the Baltic States. During the meeting, the group from Estonian urged him to visit their country to teach while the Lithuanian Representative presented him a small gift. The Dalai Lama spoke to the supporters about the deteriorating situation in Tibet, including policies that encourage massive Chinese immigration there, the imposition of Chinese language and the dilution of the Tibetan linguistic heritage, and the environmental devastation under Chinese rule. He explained that the Tibetan people were only concerned about preserving their language, culture and knowledge and had since 1974 been seeking a mutually agreeable solution rather than independence. He suggested to his friends in the Baltic States to organize a group to visit Tibet, including with environmentalists among them, to study what damage had already taken place and what steps needed to be taken to redress it and prevent further degeneration. At the end of his religious teachings after the meeting, celebrated Russian singer Boris Grebenshchikov played a gentle song to bring the session to a conclusion.